The youthful enthusiasm at the March for Life is contagious. On Friday, January 18, 2019, hundreds of thousands of pro-lifers marched in Washington, D.C. to protest and make reparation for the sin of abortion, legalized 46 years ago by the infamous Roe vs. Wade decision. The massive crowd marched from the Washington Monument up Capitol Hill, right to the steps of the U. S. Supreme Court, urging our elected officials to reverse the scandalous decision that has claimed more than 60 million innocent lives since 1973. Procured abortion is the leading cause of death in America and the world. As in previous years, TFP Student Action volunteers attended the march in force, providing rousing patriotic music with its marching band. Moving renditions of hymns such as God Bless America and Immaculate Mary were executed by a score of bagpipers in full uniform, drummers and brass instruments. The upbeat music conveyed a joyful spirit and punctuated the march with a visible desire to stand firm in the fight against abortion. 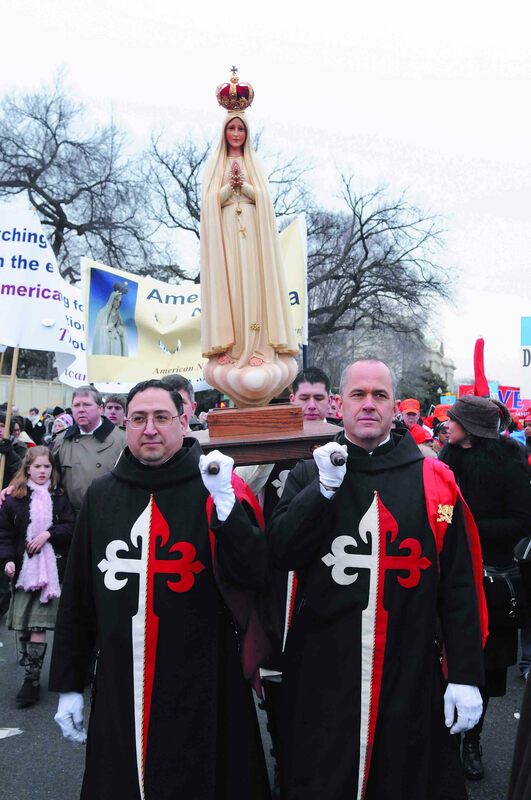 Another set of TFP members wearing the chivalrous, ceremonial habit of the organization escorted a beautiful statue of Our Lady of Fatima up Constitution Avenue. Addressing the abuse crisis affecting the Catholic Church, TFP members distributed pamphlets to the marchers titled Defending the Unborn Amidst a Crisis of Faith, which stressed the need to be vigilant and pray in this time of upheaval. Immorality is the underlying problem that has caused so much societal chaos, even within the Church. What must we do during this crisis of Faith? We cannot give up. Rather, we must continue to “watch and pray.” We must pray for God’s grace to persevere. We must watch, so that, when danger appears, we may guard ourselves against the attacks. We must remain faithful to the perennial teachings of the Catholic Church, and pray for courage to counter the snares of the devil. In addition to watching and praying, we must also fight for virtue. We are called to practice heroic virtue in this spiritual crusade. This is why we march. We march to restore the right to life and will never surrender to the lies of the culture of death. We will continue to march not only to reverse Roe vs. Wade but also to defeat the twisted culture that has spawned the Sexual Revolution. 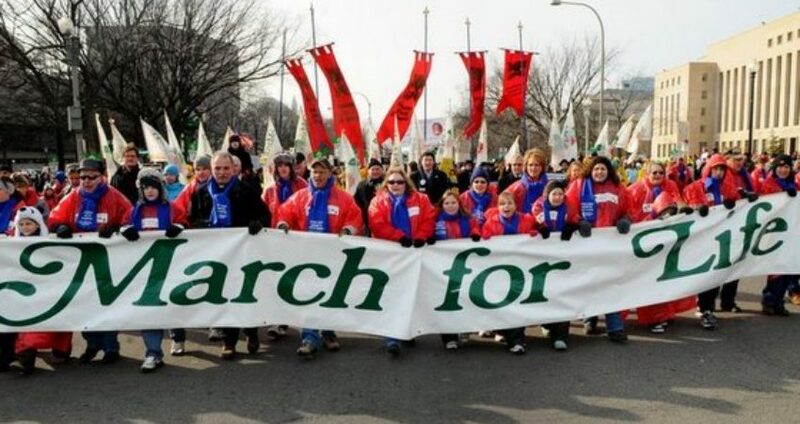 The first March for Life counted with thousands. But now hundreds of thousands attend and as time goes on, the numbers continue to grow. If we watch and pray; if we fight for virtue; if fulfill our duties to the highest degree possible, then we will aid the coming of the triumph of the truth. By fulfilling our duties, we help spread virtue and pave the way for the Reign of the Most Sacred Heart of Jesus and the Most Immaculate Heart of Mary. With God, all things are possible, even the conversion of America and end of abortion.